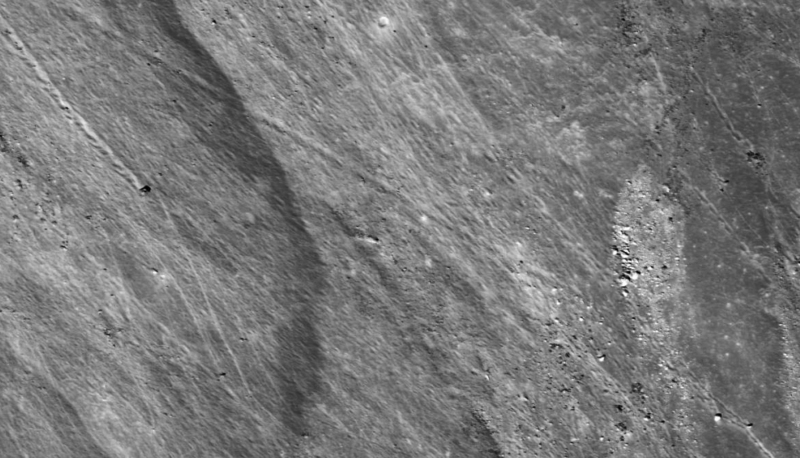 Part of a LROC mosaic of the 13-mile-wide Giordano Bruno crater, this zoom-in on the crater’s northwest slope shows the tracks left by several lunar boulders as they rolled into the crater at some point in the 10 million years since its creation. One of the boulders — the darker one at upper right — even seems to have broken apart after it came to rest… possibly the result of heating by solar radiation? Shattered boulders have been spotted before by LRO. Sometimes they even make creepy faces. Since there’s no weather on the Moon, erosion occurs incredibly slowly. These boulder tracks could be millions of years old, and will likely last for millions more. They’re relatively common features on the lunar surface, but are still interesting reminders that sometimes things can really get rolling on the Moon!